Compact Cart has plenty of storage for your travels. Hand lever for height adjustment. No tools required. Glove Box Max: 4.75" x 9.75"
Bin Holder Max Width: 12.5"
Bin Holder Min Depth: 3"
Top is constructed of solid surface marine-grade high density polyethylene. It is environmentally stabilized to eliminate warp, rot and delaminating. Simple wipe up cleaning with all common hospital solutions. 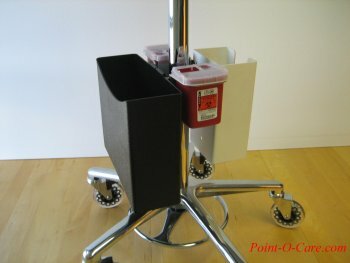 Large phlebotomy caddy accommodates HCL organizational and infection control products including the Roto Rack, test tube / syringe racks, sharps containers, Lock & Locate box, gloves and wipes. Everything you need on one level with thousands of organizational possibilities; or put your existing carry caddy on the cart along with all the other supplies you carry. Enjoy easy access to all of your supplies from all angles; easily configured and within reach. This is a small cart with huge functionality. The small size is easily maneuverable in all directions and fits next to beds and in elevators. Rounded corners double as bumpers to protect walls and the cart. Rugged construction for years of use. All surfaces are scratch and stain resistant. 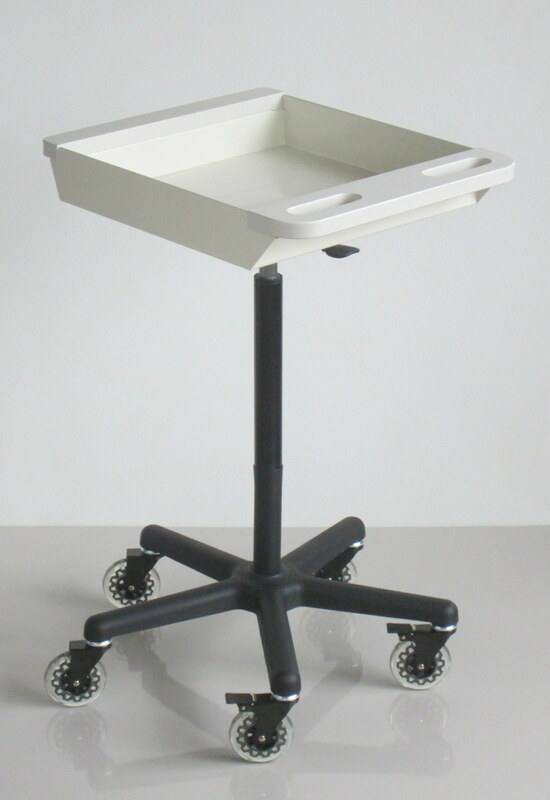 The versatile cart can be used all over the hospital for transporting supplies. 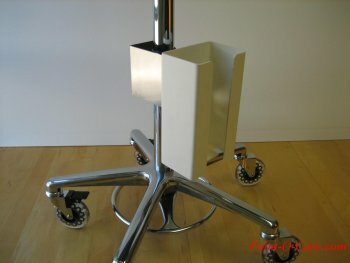 Powder coated steel caddy with square corners provides maximum storage. The deep pan keeps large and small supplies secure in motion. Handle and bumper are constructed of solid surface marine-grade high density polyethylene. It is environmentally stabilized to eliminate warp, rot and delaminating. Simple wipe cleaning with all common hospital solutions. Speedy casters enable silent movement over thresholds and onto elevators. 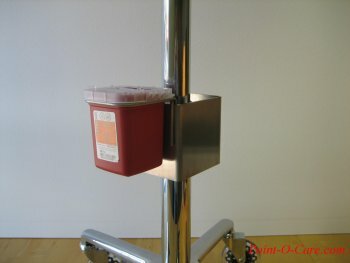 Transports your existing phlebotomy caddy or it can be the caddy. Overall Dimensions: 23-1/4" x 18-1/2"
Pan Dimensions: 18" x 17" x 3-1/2"
Packaged in UPS-able corrugated box. No tools required for assembly. Lightweight, compact, affordable, and cleanable! 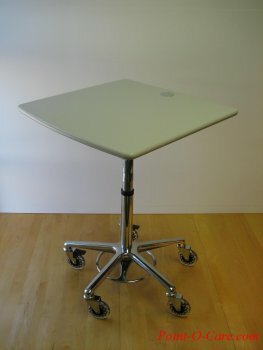 Generous size table top is perfect for laptops and other equipment. Not too small and not too big. 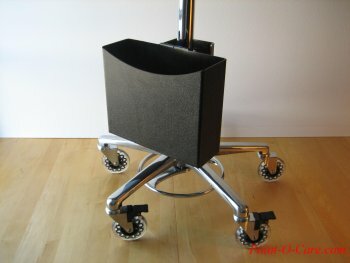 At 24" the cart will easily go through doors and crowded halls. A large grommet hole in the top will help keep cords tangle-free and organized underneath. Sit or stand to work with infinite height adjustment. Easily change the working height to fit you. Foot actuated height adjustment. Raise the table hands free. Lean to lower. Large casters provide silent running into elevators and over thresholds. Easy maneuverability makes cart perfect for point-of-care applications using laptop computers, scanners or other devices. Easy assembly! Quick assembly! No Tools Required! Plug and Play! Assembly is so simple you can have the cart built before the UPS driver leaves the building. Completely cleanable. Materials were chosen that are durable and non-porous to stand up to all standard cleaning methods. 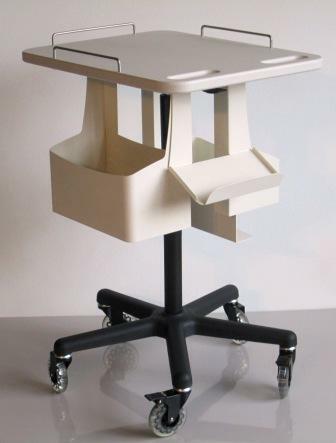 Top is PVC thermoformed MDF. Column is foot actuated pneumatic cylinder with 10" travel and chrome/black finish. Base is cast aluminum with bright anodized finish. 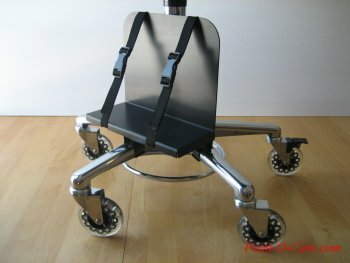 High performance casters have clear and chrome finish. Two casters lock and three run free. 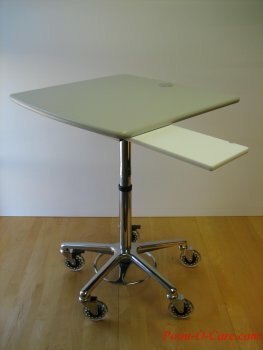 Height adjusts from 32-1/2" x 42-1/2"
Table Surface - 24" x 24"
Freight costs are reduced by a compact one-piece package. 13" x 26" x 29"
We are working on additional accessories. Check back soon for more options. Workstation is also incredibly useful in the office, warehouse, and school. The optional slide is constructed of solid polypropylene in a stainless steel track. Extends 6-1/2" x 9-1/4" on either side of the table for expanded work area. Slide ordered at the time of cart order to allow factory installation. The slide surface is removable for fast and easy cleaning.